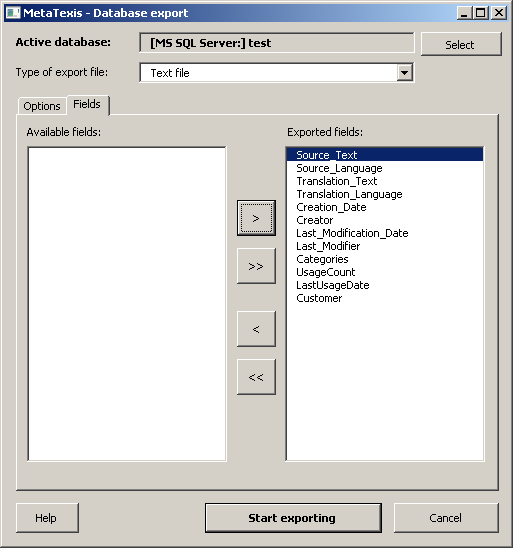 The upper part of this dialog box shows the active database to be exported. You can select another database by clicking on the Select button. The type of export file can be defined by selecting a type in the Type of export file drop-down box (default: TMX file). The Options tab consists of three parts. In the TMX version drop-down box, you can select the TMX version. Two versions are available: 1.1 and 1.4. Most CAT tools are able to import version 1.1. If you select 1.4, make sure that the target program can import this format. If Include RTF is active, any RTF text is also included in the TMX file. However, currently this field is not supported by other CAT tools. Check this checkbox only when you are sure that another CAT tool is able to import this field. For the Text file type, you can define the field separator and the content delimiter. In this format, each paragraph contains one data set, and the fields are separated by a field separator. Moreover, a text delimiter can be defined which functions as a "bracket" for the values in the field. To make sure the field separator and text delimiter are recognized correctly, they must be replaced with other characters in the field values. You can define these replacements according to the requirement of the program which will import the files. By default, the replacements are automatically produced according to the XML specifications for special characters. The easiest thing to do is to select one of the pre-defined types contained in the Pre-defined formats drop-down list. You can choose to have the field names in the first line of the text file. By default, a field with consecutive numbers ("auto increment") is added, and this field is defined as the primary key. You can de-activate both options by unchecking the related check boxes. Below the special option, you can define languages. If the Languages checkbox is active, only the TUs with the selected languages will be exported. 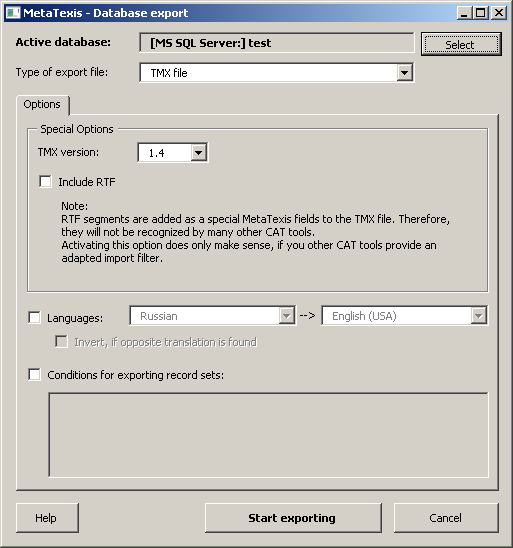 Important note: When you want to export TMX files to be imported by CAT tools other than MetaTexis, you are strongly advised to activate the Languages checkbox and define the languages to export. If this is the case, the TMX files produced can also be imported by CAT tools which do not support TMX fully. For example, TRADOS requires the languages to be defined. If the Invert, if opposite language direction checkbox is checked, any TUs with the opposite languages direction will be inverted. Please note: This option is only available for TMX files. In the lower part of the dialog, you can define conditions for exporting datasets by activating the Conditions for exporting datasets checkbox (see Import/Export Condition Language). The Fields tab is only visible for formats other than TMX, and it consists of two list boxes: Available fields and Exported fields, plus four buttons in the middle. Only those fields which appear in the Exported fields list box are exported. By default, all fields are in this list. You can edit this list by clicking the four buttons in the middle which move the selected item (> and <) or all items (>> and <<). To start exporting, click the Start exporting button. A message box informing you about the progress of the exporting process will be shown. You can stop the exporting process at any time by pressing Esc on the keyboard. When the exporting process is finished, the Save dialog box is shown. Select a name and click the Save button to save the export file.